Between getting the kids ready for school and making sure everyone is out the door on time, dressing ourselves can often feel like a daunting task. (We admit we’re typically grabbing whatever clothes are either clean or in close proximity.) On the other hand, some women have it down science—so much so, that they’re known for outfit choices. 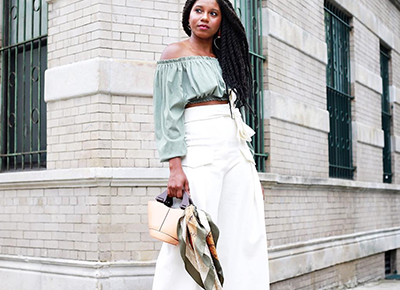 Pay attention, because these six women will have you rethinking your weekday wardrobe. As the director of fashion partnerships at Instagram and previously the editor-in-chief at Lucky, Chen is no stranger to street style. She’s constantly sharing her outfits on social media, most notably via her (now famous) #EvaChenPose. Whether walking the red carpet or taking silly Boomerangs, Chen has a knack for pushing trends, from the ubiquitous dad sneakers to Lucite handbags. Follow her Instagram Stories @evachen212 to see all of her new finds in real time. Don’t let the seemingly casual style of British Vogue’s fashion features director fool you—Harris knows what she’s doing. In fact, she’s a die-hard follower of the “third-piece rule.” You’ll often see her wearing a pair of structured jeans or trousers with a simple blouse, which she then tops with a chic blazer, coat or standout accessory (aka the third piece). If that’s all it takes to look this effortless, count us in. Twins Corianna and Brianna Dotson of Coco and Breezy Eyewear can easily be spotted in a crowd of people. Why? Their fashion choices are one of a kind. The twins value eclecticism and aren’t afraid to mix specific styles together. They often mesh the aesthetics of feminine and punk by pairing studded leather pieces with girly prints, for instance. And you can most definitely count them in for anything vintage. It comes as no surprise that Loeffler Randall founder Jessie Randall is a walking version of her brand’s aesthetic. And although she leans toward comfortable pieces, like jeans and billowy dresses, the silhouettes and patterns are always show stopping. More often than not, they also come from other female designers like Innika Choo, Dôen or Apiece Apart (which she frequently tags in her posts). Cuyana cofounder Shah stands behind the mantra of “fewer, better things”—a motto that helps women make more intentional choices when it comes to their wardrobe. Like Randall, her personal style is very much reflected in her brand. She favors solid, neutral-colored pieces for their versatility, plus the fact that they make her feel most confident. One of her personal favorites? A silk tank, because it can be dressed up or down.